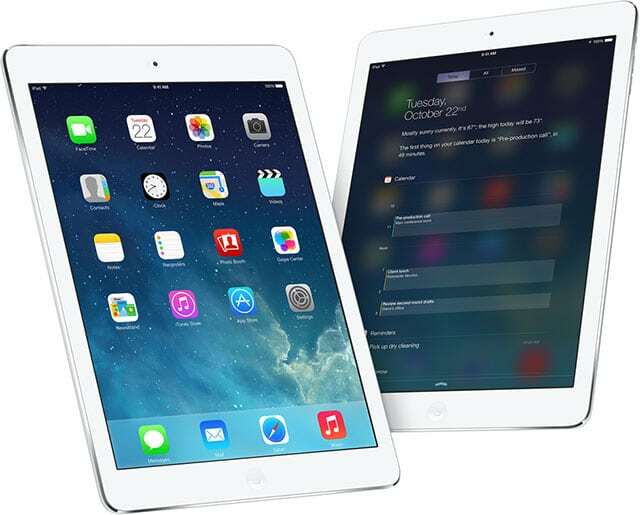 Today at its launch event in San Francisco, Apple’s Phil Schiller unveiled the latest and greatest iPad, the iPad Air. Like the MacBook Air, Apple iPad Air is thinner and lighter than previous iPad models. The iPad Air only weighs one pound, compared to 1.44 pounds in the fourth-gen model and is 20% thinner at 7.5 mm thick. The iPad Air has a 9.7-inch fingerprint-resistant Retina display. Like the iPhone 5S, Apple has added a A7 64-bit architecture processor to the iPad Air with a M7 motion CPU that acts as a sidekick. The new iPad Air also sports MIMO for faster WiFi, and has more LTE support for international carriers. For videos and pictures, the iPad Air sports a 5-megapixels which can record 1080p HD videos. Dual microphones are something new you will find in this iPad. The iPad Air support two microphones that capture better audio. By using dual microphones Apple claims that FaceTime calls and video recording will sound clearer. Siri will also have a higher chance of understanding what you say. The iPad Air will be shipped and available in Apple stores on November 1st starting at $499 for the 16GB WiFi model. It will be available in two colors including space gray and silver. The Air will come in 16GB, 32GB, 64 and 128GB.